HomeAll postsSports NewsST Agnes Rugby Prowess Hits the National Press!!!! ST Agnes Rugby Prowess Hits the National Press!!!! 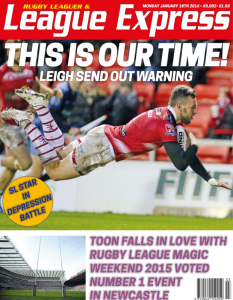 Throughout January YR3 and 4 pupils have participated in a ‘Sky-Try’ rugby league initiative, lead by community ambassadors from the newly formed Manchester Rangers RLFC . 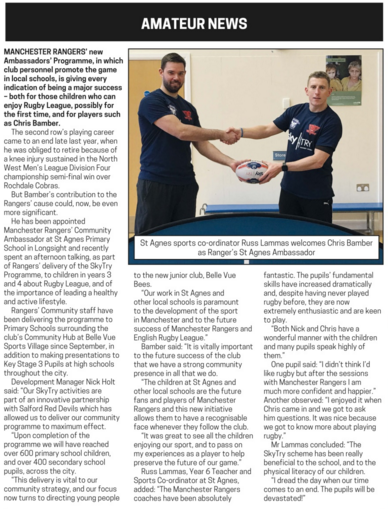 The Sky try initiative involved Rangers ambassador Chris Bamber and Development manager Nick Holt visiting the school each week for a six week period to deliver a programme of rugby coaching, with a focus on promoting fundamental PE skills and a healthy active lifestyle. The coaches and the programme have been fantastic and the pupils have absolutely loved it! 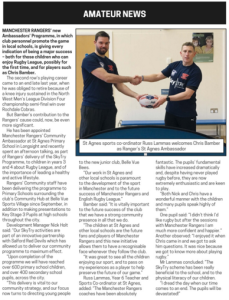 In recognition of the success of the scheme and the schools commitment in promoting the game and creating club links, we were asked to appear in the League Express, a national publication! 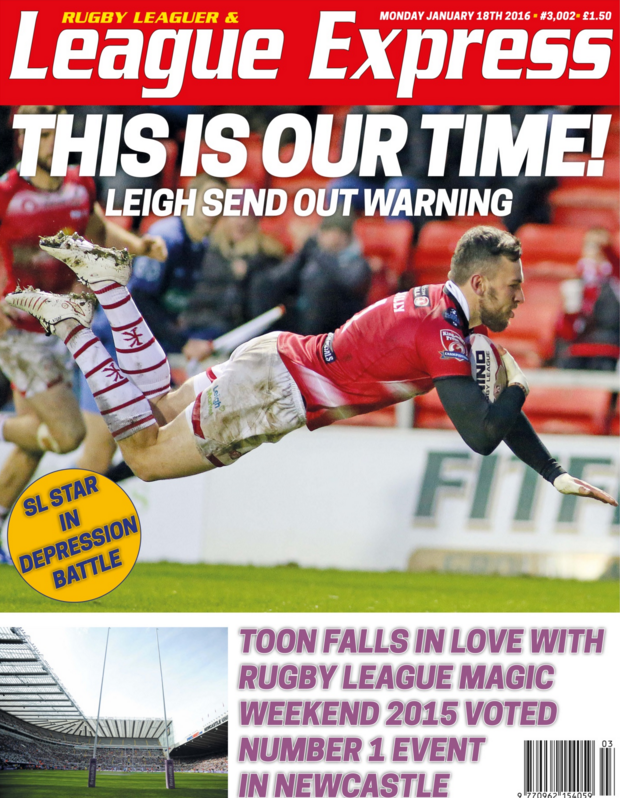 A huge thank-you must be expressed to the enthusiasm of the pupils and parents/carers in supporting their children in participation (see the PE noticeboard to read the complete article). We are only just into March and yet already we have seen a stellar increase in the number of pupils participating in after school clubs, so dramatic has the increase been that there are now more pupils wanting to participate than places in some activities and extra clubs are in the pipeline, watch this space! Furthermore within school during lunchtimes we have a fantastic and dedicated group of YR5 & 6 sports-leaders, who lead sporting activities and inter-school competitions during lunch. Pupils lead by the leaders have had the opportunity in competing in hockey, basketball, dodgeball, target-throwing, penalty taking, keepy-uppy and cricket. Furthermore KS1 pupils have been supported in developing their fundamental skills with activities lead by the sports-leaders on the upper-playdeck.